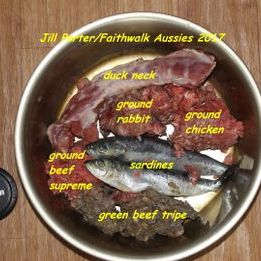 I decided to expand on my "Feeding Your Aussie" page with more details of feeding a raw diet. I get more questions on that than almost any other topic on my website. I have been feeding my dogs a human grade raw diet for about 15 years now and am thrilled with the results. Having fed various premium dry foods (kibble) for 15 years prior, I was familiar with the quality of the health of my dogs on that type of diet. They were in good shape, better than dogs I met which were fed the mid or lower grade dry foods. But I always wondered why, if dogs are carnivores, we fed them kibble (dry food) made with mostly grains. I figured I could do better than just dry dog food. Since I had worked with captive wolves for a couple decades, and saw how they ate (a totally raw food diet, whole prey animals for the most part), I figured dogs should do well on that too. This was the same time frame that feeding a raw diet was starting to become more well known in the dog community. Many books, websites and articles were being published, and email chat lists were forming. I was one of the original founding members of one such group. I learned and contributed a lot and was able to compare notes with other raw feeders as I began this way of life. **** One thing to note though is you may receive resistance from your veterinarian as you start to feed your dog this way. Many only believe in only feeding processed food (kibble/dry dog food) since that is all they were taught in school. Just think of it this way though. How would it be if your human doctor told you to NEVER eat any fresh fruits, vegetables or minimally processed grains or meats, and only eat canned, boxed and other heavily processed foods? The outcry would be tremendous as it's a proven fact those are not good for long term health in people. (Think hotdogs, frozen dinners, canned foods like ravioli, stuff full of preservatives and food coloring.) These vets will tout the risk of salmonella or e coli in raw meats. My reply to that is actual documented statistics in humans show a far higher risk and actual cases of infection from raw produce! And no one says not to eat fresh fruits and vegetables. Also, dry dog food companies routinely issue recalls for toxins like mold, as well as salmonella in their dry food products. So there is risk there too. Just something to think about! 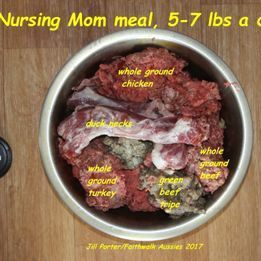 Do not let your vet scare you out of feeding a balanced raw diet, if you have decided to do this. Some of us have agreed to disagree with our vets, others find a more open minded one. "Some of the basic concepts you must understand as you embark on this mission, is that you strive for variety over time." Some of the basic concepts you must understand as you embark on this mission, is that you strive for variety over time. It would be fairly hard to try to get a totally balanced meal every time. Even health minded people don't eat that way. Instead we may think of balance over about a week's time. That's what I do with my dogs. I try to feed them a variety of meat sources, bone and organs each week. Part of what I use is based on what is available to me, and that will be true for anyone feeding raw foods. Mostly my dogs get various cuts of chicken, turkey, beef, bison, venison, lamb, duck, goose, emu, goat, rabbit, alpaca, llama, fish and others, with lots of green tripe. I personally avoid raw pork but some feed it. 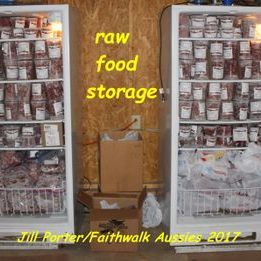 Since raw feeding is more common now, there are more websites and companies devoted to selling supplies. That has greatly expanded the menu I am able to offer my dogs. I also get some of my supplies from the local butcher (special ordering cases of turkey necks, beef heart and such), and from the grocery. Many raw feeders learn to buy in bulk so they can stock up when they find sales. I repackage anything I need to so I can thaw out what I will use in 1-3 days time. It's not a lot different from buying meat for your human family. You may shop once a week or so, and plan your menu accordingly. I also bought a couple big freezers so I can stock up when I find good bargains. What I also try to do is give the meat, bone and organs in a rough ratio of 35% bone, 15% organs and 50% meat. This would approximate most carcasses, though some may be heavier on meat. I also try to make sure they get meat, bones and organs from the various animals, not just chicken, just beef or whatever. Giving cuts from at least 3-4 different kinds of animals each week will help make sure your dogs are getting the variety they need. They can't eat JUST muscle meat (stew beef, chicken breast, hamburger and so on). They MUST have a digestible source of calcium to be healthy. One thing you can get to add plenty of that is something my friends and I call "bone dust." It's the shavings left when the butcher cuts meat. It's rich in marrow, bone shavings with some meat and fat. It is raw and looks somewhat like hamburger. I can't get it any more but have access to enough other bone. I used to get it from my butcher for a small price. It's very rich so I don't add much to a meal. If you feed something very meaty like a chicken breast, adding some bone dust balances out the meat to bone ratio. Another thing to consider is feeding more fatty cuts to active, young or growing dogs, and leaner cuts to older, more sedenary dogs who need to watch their weight. Many premade formulas have the fat listed so you can shop accordingly. Another thing to consider is what kinds of bones can your dog safely have. I know most dog owners have been told by their vets to NEVER feed bones. Well, the big thing is those are cooked bones. Cooked bones are far more likely to splinter when chewed and cause serious problems for your dog. I and some raw feeders also may avoid the long bones (leg bones, turkey wing, beef ribs, and such) as they are more prone to splintering even when fed raw. Instead I prefer the rounded bones such as those found in turkey necks. Some raw feeders use beef knuckle bones too. Dogs love them. The downside with those is they are messy and somewhat rich and fatty, so may be too much for dogs who are prone to obesity or diarrhea from an overly rich diet. If your dog is prone to gulping or not chewing well, you will want to stick with larger things it has to chew. You can also feed things partially frozen so the dog has to chew better. The bones that I tend to feed are those in turkey and chicken necks, chicken breasts, chicken backs, and anything ground such as the bone dust, or in the products I buy from the raw food company I use. Many companies are now grinding whole prey animals into a form even puppies, cats and small dogs can handle. 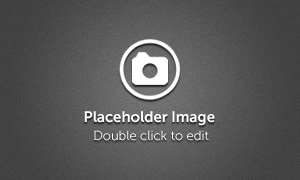 The resulting product may have organs or other things added, but are at least meat and bone. The bone fragments are small and easy to digest. The downside is the dogs don't get the added benefit of chewing, but these forms of raw food are far safer. You can still offer larger bones for recreational chewing to build muscle and clean teeth. I also get asked about the risk of bacteria like salmonella. Well, there are several things to consider. First of all, a healthy dog can usually handle such things just fine. Think about what our dogs eat if given the chance. These include garbage, rotten dead animals they find in the yard or on walks, feces of just about every animal, and so on. Bacteria could be a risk to an old, very young or sick dog, but to the average dog, it's not nearly as risky as some of the stuff found in cheap dog food. Also, think of how many times there have been recalls for various contaminants in many brands of commercial dry or canned dog food and treats. These include toxins, molds, bacteria and so forth. Even the pig ears you buy at the pet store may be contaminated with salmonella. I figure that by feeding raw, fresh, properly handled raw food, I will actually DECREASE the risk of my dog eating something harmful. You should note that safe handling of raw meat includes keeping it frozen or refrigerated, and thawing in the refrigerator, not on the counter. Another thing I get asked is if feeding raw meat makes a dog "mean." That's simply an old wives' tale. My dogs have been raised on raw meats since they were tiny and they are great with each other, with small animals, our cat, and so on. The prey drive of a dog (the instinct to chase things that move) is not tied into to eating raw meat, but is hard-wired into a dog. Even eating a certain kind of meat (say beef) will not make them want to "hunt" cattle any more than they may want to anyway. Certain breeds, like Siberian huskies, are very predatory by nature, no matter what they eat. On the other hand, breeds like livestock guard dogs who are raised with their flocks can eat raw meat and not want to hunt the animals they are charged with guarding. It is more about the individual dog and the breed than the diet. My own dogs will chase small animals out of the yard yet be good with OUR animals. Being Aussies, that is part of their instinct to chase away animals that don't belong but protecting the ones that do. It has nothing to do with what they eat. "Other benefits of feeding a raw diet include clean teeth, strong jaw muscles, and a body and immune system kept in peak condition." Other benefits of feeding a raw diet include clean teeth, strong jaw muscles, and a body and immune system kept in peak condition. My dogs don't need to get their teeth cleaned by the vet, and their heads and jaw muscles are well developed. They don't have issues with skin allergies and other common health ailments that are often seen in dogs fed a dry dog food diet. Cancer and diabetes are more common in dogs feed dry dog food. Cancers love grains and carbohydrates. I have even heard of cases of diabetic dogs being cured by switching to a good raw diet. This is something that should be managed by a vet who is knowledgeable in such things though. Also, raw food has all the necessary enzymes to digest the food, so the body doesn't become depleted over time. This is critical to help the body fight illness. Fresh, wholesome foods build the body while processed foods deplete it. It is the same with people. Processed foods have all the enzymes destroyed by cooking, so the body must manufacture the needed enzymes to digest the food. That is one reason it is recommended to switch dry foods slowly. I will say that with the way I feed my dogs, they can go back and forth between various foods just like people can. Their bodies are used to variety and are not depleted. The dog pictured above recently weaned a litter and had not been groomed in over 2 months. That shine is from her diet. Another thing I like about feeding a raw diet is that I KNOW what my dogs are eating. In kibbles, especially lower quality ones, they use all kinds of nasty waste materials, from the 4D meats (dying, dead, diseased and decaying), euthanized pets from shelters, old oil from restaurants, road kill and so on. The better kibbles use better meat but still must be more grain than meat to go through the extruders that form the shapes of the food. When I serve up a meal of human grade raw meat, I know my dogs are getting fresh, wholesome food. I do know many vets will give their clients a hard time about feeding this sort of diet. It is good to find a vet that is either educated on the topic or at least open to it. Some may be against it until they start to see the results. They can't argue with that. But know that if you feed an imbalanced diet (such as just meat) your dog's health will suffer, and I am sure you will get an "I told you so" from the vet. Many vets have been taught in school that feeding dry dog food is the only way to go. However, that's just been the status quo and their brief bit of nutritional training in vet school is often sponsored by Hills, maker of the many prescription diets and Science Diet dog foods. That company has a vested interest in making sure vets promote their foods! The good news on this topic is that more and more holistic minded vets are available, so especially if you live near a larger metropolitan area, you may be able to find one. There are many good books, websites and articles on the topic, and various email chat groups and lists you can join. Next I wanted to go in to a bit more detail about how I feed my own dogs. 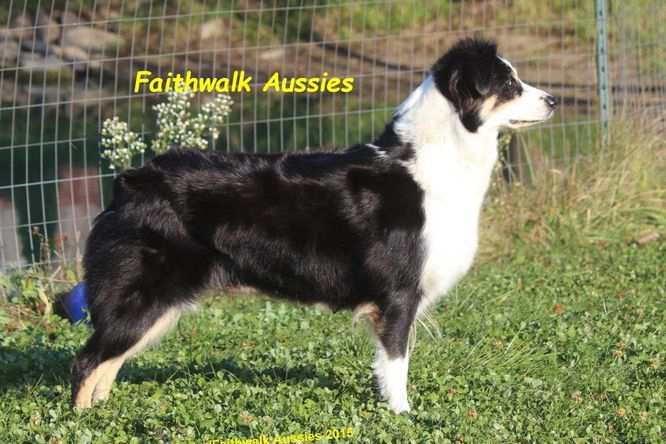 Since my dogs are Aussies who range in size from about 40 to 60 pounds, portions and cuts will be geared toward them. I will also give some info about feeding puppies until they are able to eat like adults. Some basics I do is usually feeding raw food separately from dry food. Raw digests far easier and faster so is best fed separately. For me, feeding raw in the mornings works better. I do still feed some dry food in the evening, and add the supplements to that. You can feed a totally raw diet though. 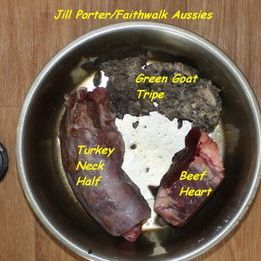 Green Tripe - beef tripe or other is an EXCELLENT food and has an ideal balance of phosphorous and calcium. I feed a small amount every day. Each day I may try to feed 2-3 kinds of meat. If I feed a bony cut like a turkey neck, I balance it with muscle meat and/or organs and tripe. If I feed a meaty cut like a chicken breast, I balance it with bone dust or a duck neck. I will say I very seldom feed chicken from the grocery now. If you only have one dog it can be harder to feed as much variety in every meal. Still, you can do variety over the week. Since I feed multiple dogs in one day, I can open more kinds of raw and give each a portion, and still use it up before it gets old. For amounts, I feed about 1-2 lbs raw per day, per 50 lb dog. My dogs are fit and very active so eat a little more than a more sedentary or older dog. A general rule of thumb is to feed 2% of their body weight daily, more for active or growing dogs, less for old, overweight or sedentary dogs. So a 50 lb dog would get 1 lb if it's less active, 2 lbs if it is more active, less if older or prone to getting to heavy. I tend to check my dogs' body weight regularly and add or subtract quantities accordingly. If you feed a part raw, part kibble diet, feeding closer to 1% of it's body weight and a cup or two of kibble would work. Spayed or neutered dogs would eat less of course, than dogs who are not. Also not all raw is equal in terms of how fatty it is, so take that into consideration. Growing dogs or puppies may eat up to 3% to 5% of their body weight. The only thing I do differently with puppies is avoid the bigger cuts like chicken breasts or turkey necks. 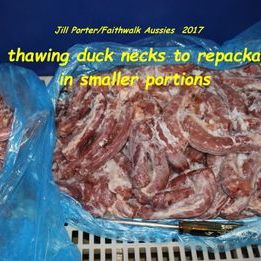 I start them on chicken necks at about 10 weeks or sooner, and duck necks at about 12 weeks. They get turkey necks once their adult molars are in, at 5 months or so. I use a lot of the ground meats with bone in before that, as well as the bone dust and organs. They start the supplements at about 8 weeks of age too. One thing to consider when comparing amounts of raw meats to dry food is meat has a far higher water content. So one cup of meat is not equal to one cup of dry food. It may be closer to half a cup. That is actually good for dogs needing to lose weight. They can eat more and feel more full than on dry food. Also, grains are fattening. Think how they put cattle on grain in feed lots to fatten them right before slaughter. Using leaner cuts of meat, bones and organs can help keep your older or overweight dog leaner. It's a far more satisfying way for your dog to eat as well. I will say I am VERY happy with the My Pet Carnivore products, and haven't had so much fun making the dogs' meals in years! I use and recommend adding probiotics on a regular basis (even if you only feed dry food.) Most of a mammal's immune system is in the gastrointestinal tract, so keeping that healthy goes a LONG way toward overall health. Most products come in the form of a powder you add daily to meals, or at least a few times a week and especially in times of stress. If you ever have to give antibiotics for any reason, adding probiotics daily is recommended. Two brands I use are Forti-Flora which comes in single serve packets, and a formula I buy from Nature's Farmacy called Probiotic Max. UPDATE: My brand of choice is Gentle Digest. You can order online. I also add supplements, and would no matter what I feed (all raw, all kibble, etc. Five days a week the dogs get 1000 mg of fish or salmon oil, and once a week I give 400 iu natural Vit E, both of which are human grade. I feed these supplements because any oils in dog food lose their potency shortly after exposure to air. So any oils added to dry dog food have almost no bioavailability to the dog, by the time it is consumed. These oils help the dog's coat, immune system and even drastically reduce shedding! I start adding the salmon or fish oil in a pup's diet by about 8-10 weeks of age Pups get 1 of the 1000 mg salmon oil 5 days a week, and I start the natural vit E around 10 weeks. I personally avoid long bones like legs, wings,etc. 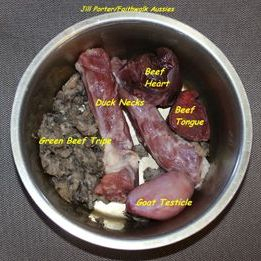 My dogs get enough bone in the turkey necks and what is ground in the coarse ground mixes. Since I have more than one dog, I can open several 2 lb containers a day and everyone gets good variety. With a single dog you will do variety over the week, not every day (though you can usually use up a couple of the 2 lb containers in a couple days.) I give the organs that are not ground on days they get turkey necks, and I give some kind of neck every day for chewing. I hardly ever use chicken necks now, only duck or turkey. Chicken necks don't have as much bone in them. 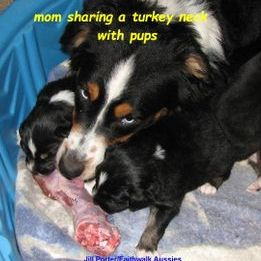 The picture shows very young puppies digging in to raw food from their mom's meal. I have noticed that they try to eat it before they even open their eyes. They know what real carnivore food is. I have never been able to get them to eat dry food that well when first weaning, even when I mix good canned food and warm water. Once I started adding in raw, they did it better and now I just wean them on to raw. They did okay on the premium dry food but do so much better on raw! Once pups are weaned onto ground raw (meat, bones, organs, tripe) and I start feeding them in individual bowls, I am still trying to get variety into them. 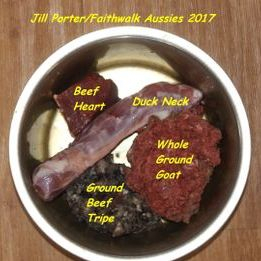 At this point I use the fine ground My Pet Carnivore products, since they are balanced, bone is ground finely, and there is variety. As pups grow, I gradually add whole cuts of things starting with chicken necks at 10 weeks of age, then duck necks at maybe 12 weeks of age, then at 5 months or so, when the adult molars are in, they get their first big turkey necks, usually the big ones cut in half and pups get the top or smaller half. It's hard for them to chew them before that. Before that I mostly feed them the ground products from My Pet Carnivore. 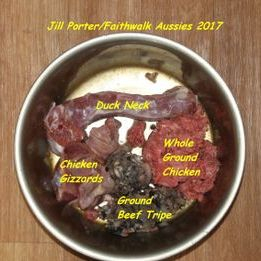 Other stores around the country may sell some of the other brands of raw ground foods, such as Bravo, Primal, and many more. Just like with the adults, I try to feed several meat sources per day and using variety over the week, such as chicken, venison and rabbit one day, beef, turkey and duck the next, goat, chicken and lamb the day after. Remember, VARIETY OVER TIME is the best way to feed raw. Folks have asked me how much I feed, and it's generally about a 3/4 to 1 pound a day at 8 weeks of age and goes up as the puppy grows. I watch the weight and the stools, keeping the pups lean and fit but not too thin. Raw fed pups tend to be solid and muscular compared to kibble fed pups who may be chubby or "doughy" feeling as I call it. To switch a puppy to raw from a kibble only diet, start slowly. I add a small amount of raw each day. This is one time I do feed kibble and raw in the same meal. I will start with some of the ground chicken meat/bone/organ mix, giving a piece about the size of an egg yolk. I watch the stool each day and if the pup is doing fine on it, I gradually increase the amount until it is eating a whole raw meal. I then will increase the variety, adding the red meats, organs, and even a chicken neck. Just take your time and if the stools are good, the pup is switching just fine. They don't always have the more exotic meats in stock anyway but I get them when they do. I don't use the Ground Young Beef or Ground Whiting very often since it's too lean for growing puppies. It would be okay for adult dogs who need to watch their weight, but only with other foods with some fat as they need some in their diet. Same for Rabbit - they get it sometimes but not often. They like it, it's just very lean. Even the Beef Tripe is lean but the benefits of tripe are great so I use it regularly. For very young pups I use the 1 lb tubs of the fine ground mixes - starting with Turkey Necks. I use FINE GROUND products from weaning until 10+ weeks of age. The other tubs are the 2 lb size. I don't like the 5 lb tubs since they don't thaw as evenly. I thaw all of it in the refrigerator and use it up fairly fast - in a day or two. I personally avoid raw pork products. I also may give pups small bits of beef, lamb or bison heart, or other organ meats. Don't use too much organ meat at any one time as it gives them the runs - it's very rich. All meals should have a form of bone, so avoid the meat/organ only mixes as a main meal. I add some in, just not feeding solo. 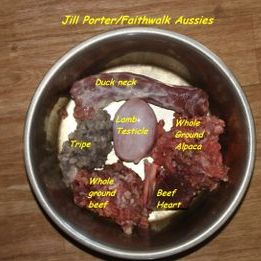 The Beef Organ Mix is a no-bone formula and is too rich for puppies. Even with adult dogs use small amounts fed with other products with bone. Most of the ground mixes do have bone, so if in doubt read the labels. All the products on the site have some info, most a fat and protein percentage listed. For pups, I use fattier ones more than leaner ones. Of course as they grow I add whole things like chicken necks, then duck and later turkey necks. These same products work well with adult Aussies too! Another benefit of feeding a raw diet is the nice clean, white teeth! This photo shows a 10 year old dog who was raw fed since 7 weeks of age. He has never had his teeth brushed nor professionally cleaned by the vet. Chewing through his raw food is all the tooth cleaning they need. This is typical of a raw fed dog's teeth. 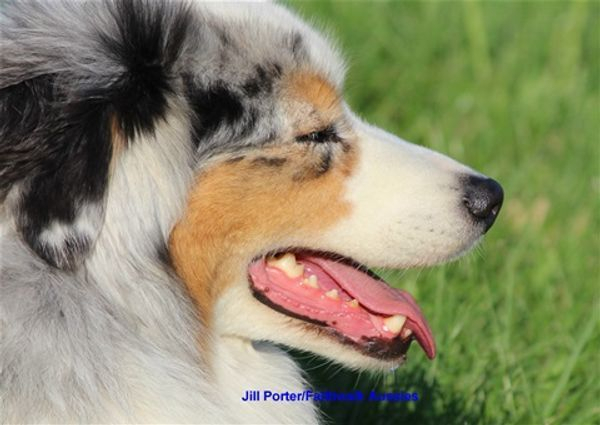 It should be noted that clean white teeth are not just appealing cosmetically, but are much healthier for the dog. The bacteria that can build up on dirty teeth can get down in the dog's blood stream, via the digestive tract, and over time can cause organ failure and even contribute to premature death. Many owners have to have their dogs' teeth cleaned by the vet, a procedure done under anesthesia. That comes with it's own risk. Some vets will even have to start the dog on antibiotics before cleaning the teeth, as a precaution for the bacteria that the dog will swallow once it's knocked loose from the teeth. To me, a HUGE benefit of feeding a raw diet, is being able to avoid all that. "Study to show yourself approved unto God, as a workman who does not need to be ashamed, accurately discerning the word of truth."